Our campaign to Save Our Swan has drummed up a lot of interest. Apart from this website, social media, emails and leaflet drops, we have appeared many times in local media. Keys of The Swan now with Community. The Swan pub is almost ours. By Anne Tebbatt, January, 2019. Raising a glass for group who saved The Swan. By Kieran Bell on Friday 8th February, 2019. Here's to The Swan and a group effort. By Kieran Bell on Thursday 7th February, 2019. Presented by Tara Maxwell on Monday 4th February 2019 (BBC login required, search to 1:03:25). With Phil Kennedy and Jo Beck on Monday 4th February 2019 (BBC login required, search to 10:08 minutes). The Swan campaigners receive keys to pub. By Florence Leslie on Saturday 2nd February, 2019. With Phil Kennedy on Thursday 30th January 2019 (BBC login required, search to 10:30 minutes). Campaigners exchange contracts for The Swan pub. By Kieran Bell on Thursday 10th January, 2019. 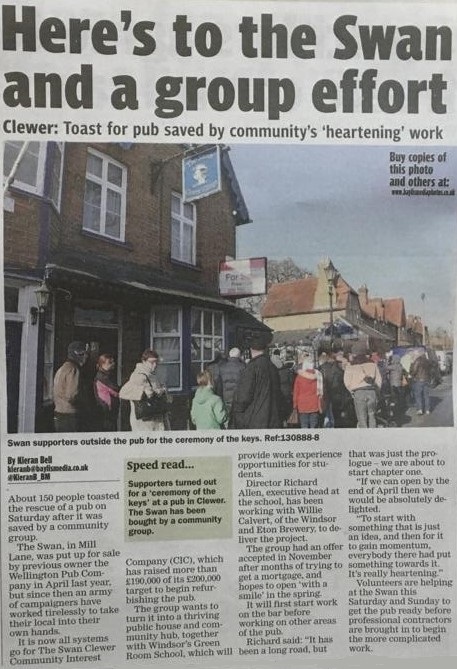 Community group has bid for The Swan pub accepted. By Kieran Bell on Friday 30th November 2018. With Phil Kennedy on Monday 26th November 2018 (BBC login required, search to 39:46 minutes). With Phil Kennedy on Monday 26th November 2018 (BBC login required, search to 10:35 minutes). With Phil Kennedy on Monday 12th November 2018 (BBC login required, search to 40:00 minutes). Group puts in its bid to buy pub. By Kieran Bell on Friday 9th November 2018. Campaigners raise more than £110k to save the Swan pub. By Kieran Bell on Saturday 3rd November 2018. By Kieran Bell on Friday 19 October 2018. By Will Taylor on Friday 03 August 2018. By Francis Batt on Friday 6th April 2018.